Kormos in Greek means tree log and has been named after its shape. You can find this dessert under various names such as mosaico, doukissa, salami etc. The name “Mosaiko”, which means mosaic, from the patterns made when the dessert is cut. There are many variations of this simple dessert but I think it’s the small details which make the difference. This dessert was made a few days ago and has gotten a makeover to celebrate my husband’s name-day, which is on the 26th October. I based this recipe on an older one of mine, which is the one that follows, with the old photo. Leave butter outside the fridge for 2 hours to soften. Beat butter in mixer with cocoa and sugar until fluffy. Mix in vanillas and walnuts (leave some to put on top if you like). Put milk and liqueur in a bowl and wet biscuits (but do not soak them), then break them into small pieces and add to the butter mixture. Mix well. Cut two big pieces of parchment paper and put the mixture giving it a salami shape. Sprinkle with the walnuts. Roll and fold. What makes it different in the new recipe, is the addition of melted dark chocolate in the buttercream and instead of vanilla I added raspberry essence, which goes well both with the dark and white chocolate. I also added coarse sea salt, which bursts into your mouth, enhancing all the flavours, thus leaving a wonderful taste. Finally, the addition of Greek homemade fruit preserves adds an extra bonus. I added “Glyko Sykalaki” (Fig Preserve, filled with Roasted Almonds) in the one I coated with the dark chocolate and “Glyko Kerassi” (Cherry Preserve) in the one I coated with the while chocolate. In the past I made a different version of Kormos, Choco Orange with chocolate buttercream, adding some Orange Fruit Preserve inside. Citrus Fruit Preserves combined with Chocolate are meant to be together! In the same post, you will find another one made with white chocolate. As I said this is a very easy dessert but it’s so delicious that it disappears in no time, so don’t worry if the result makes two logs. You can keep one in the freezer but it will disappear in no time as you just cannot eat only one piece! This biscuit log is an old family recipe. I've made several additions by adding fruit preserves in it and chocolate ganache on top. Sift icing sugar and cocoa. Melt the chocolate over a double bath (bain Marie). Set aside to cool. Beat butter, cocoa and sugar using a hand mixer, on low speed, until fluffy. Add the melted chocolate, coarse sea salt and raspberry essence and mix to combine, increasing the speed. In a separate bowl break the biscuits into smaller pieces and pour the milk. Mix it quickly so that they are evenly wet. Add the biscuits to the buttercream gradually, mixing with a spatula, until all of them are added. Cut two big pieces of parchment paper and place a piece of cling film on top of each. Divide the mixture along the centre of both cling films, making them flat. Add the cherry preserve along the centre on one of them and cut the fig preserve in half, placing the cut side facing up. Fold with the help of the cling film, giving it a salami shape. Roll until round and wrap them in the cling film. Wrap them with the parchment paper as well. Place them in the deep freezer for a couple of hours before coating. Put the heavy cream in a microwave safe bowl. Break the white chocolate into smaller pieces and heat on medium heat for 1 minute. Mix with a spatula until the chocolate melts. Repeat for 30 seconds, if necessary. 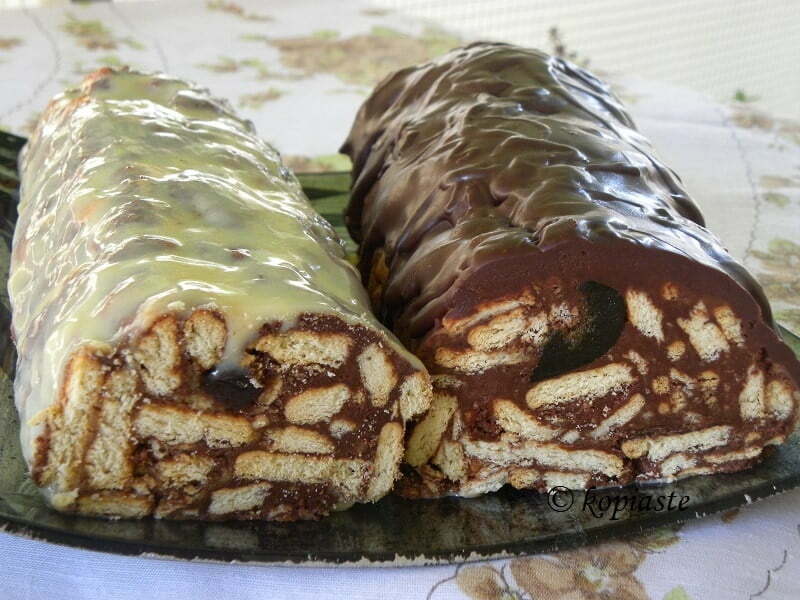 Refrigerate the ganache to thicken and spread on the biscuit "kormos" (log). I used a double boiler to make the dark chocolate ganache. 1. The logs can stay in the freezer for a long time before coating them with chocolate. If coated, freeze them first and then wrap them in cling film. 2. The first time you put them in the freezer, place them on a flat surface, such as a tray, so that they will not break. The new recipe was updated on 26 October, 2016. This looks wonderful, so many great recipes here. This sounds very easy. I’ll make it with my children who love chocolate! I remember my mom used to make this when I was a kid. Thanks for sharing. I will make it soon! Thanks for sharing this receip of choclate dessert. i am really love the chocolate. I will try to make it at my home. Milk Chocolate add white chocolate are both sweet. My brothers and sisters are fond of this but the first one is a favorite of mine.